If you have a web site, you are a publisher. If you are on social media, you are in marketing. And that means that we are all relying on our words to carry our marketing messages. We are all writers. Yeah, but who cares about writing anymore? In a time-challenged world dominated by short and snappy, by click-bait headlines and Twitter streams and Instagram feeds and gifs and video and Snapchat and YOLO and LOL and #tbt...does the idea of focusing on writing seem pedantic and ordinary? Our writing can make us look smart or it can make us look stupid. It can make us seem fun, or warm, or competent, or trustworthy. But it can also make us seem humdrum or discombobulated or flat-out boring. That means you've got to choose words well, and write with economy and the style and honest empathy for your customers. And it means you put a new value on an often-overlooked skill in content marketing: How to write, and how to tell a true story really, really well. That's true whether you're writing a listicle or the words on a Slideshare deck or the words you're reading right here, right now...And so being able to communicate well in writing isn't just nice; it's necessity. And it's also the oft-overlooked cornerstone of nearly all our content marketing. These lessons and rules apply across all of your online assets like web pages, home page, landing pages, blogs, email, marketing offers, and on Facebook, Twitter, LinkedIn, and other social media. 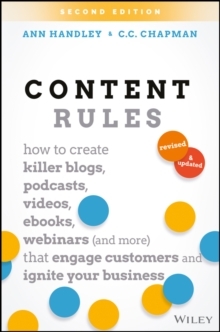 Ann deconstructs the strategy and delivers a practical approach to create ridiculously compelling and competent content. It's designed to be the go-to guide for anyone creating or publishing any kind of online content whether you're a big brand or you're small and solo. Sections include: * How to write better. (Or, for "adult-onset writers": How to hate writing less.) 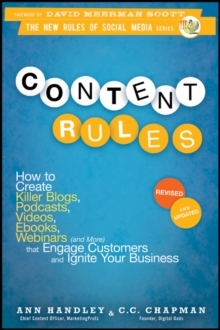 * Easy grammar and usage rules tailored for business in a fun, memorable way. (Enough to keep you looking sharp, but not too much to overwhelm you.) * Giving your audience the gift of your true story, told well. Empathy and humanity and inspiration are key here, so the book covers that, too. * Best practices for creating credible, trustworthy content steeped in some time-honored rules of solid journalism. Because publishing content and talking directly to your customers is, at its heart, a privilege. *"Things Marketers Write": The fundamentals of 17 specific kinds of content that marketers are often tasked with crafting. * Content Tools: The sharpest tools you need to get the job done. Traditional marketing techniques are no longer enough. 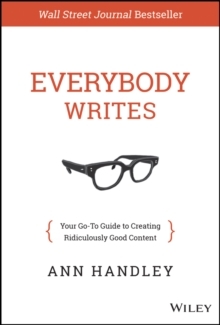 Everybody Writes is a field guide for the smartest businesses who know that great content is the key to thriving in this digital world.